Toss: WIPRO won the toss and elected to bat. Wipro won the toss and opted to bat. Probably ACT’s best chance in the game came off the very first ball of the innings. Shankar had Karthik reaching out and had him driving his square-drive in the air only for the point fielder to put it down. 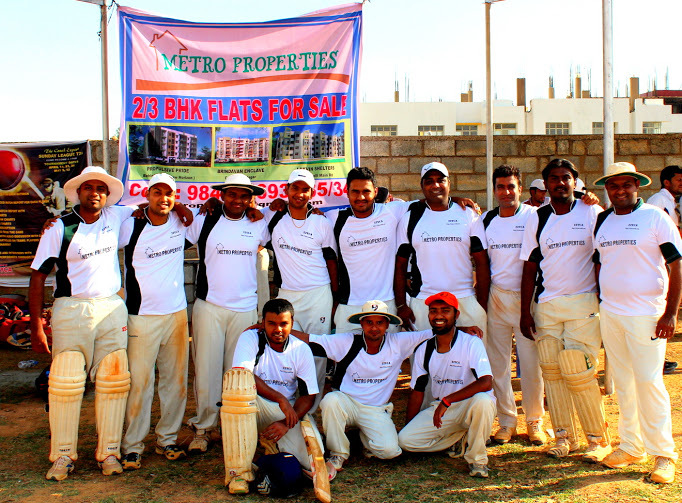 From thereon, Wipro plundered runs at both ends against all bowlers. Jagmohan seemed to be in a hurry as he went after the bowlers from the very first ball punishing ACT bowlers at will, on both sides of the wicket and off both front foot and back foot. Karthik was equally aggressive at the other end. The pair plundered 75 runs in the first 6 overs and a total well in the excess of 200 seemed a distinct possibility. ACT seemed to be missing their strike bowler Unni who was unavailable to play today and the strain of plugging too many holes was evident in the captain Sharath’s face who later admitted to missing his two regular bowlers (left-arm spinner Thomas sat the game out with a finger injury as well). The introduction of spin in the form of Prashanth and Shitu slowed things down a little. Shitu especially seemed to generate appreciable bounce from the wicket. 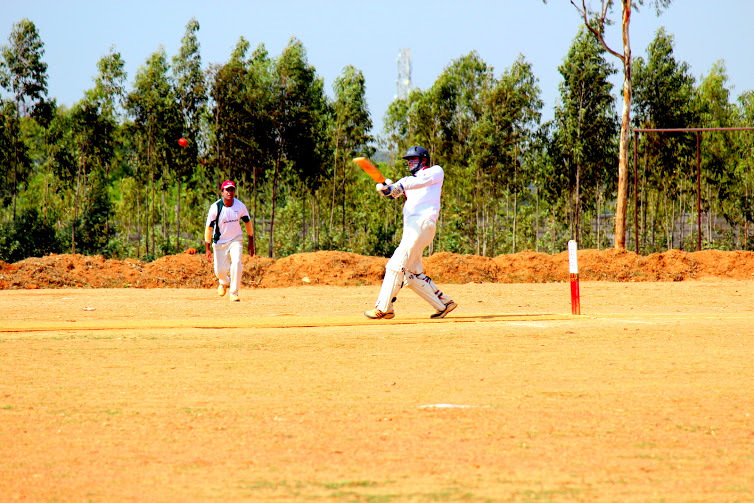 Prashanth kept things tight and it resulted in Prashanth picking up both the openers at the other end within a span of 10 balls. With the score reading 93/2 in just 8.4 overs, Wipro only needed to ensure that there was no collapse so as to mount an assault later in the innings. 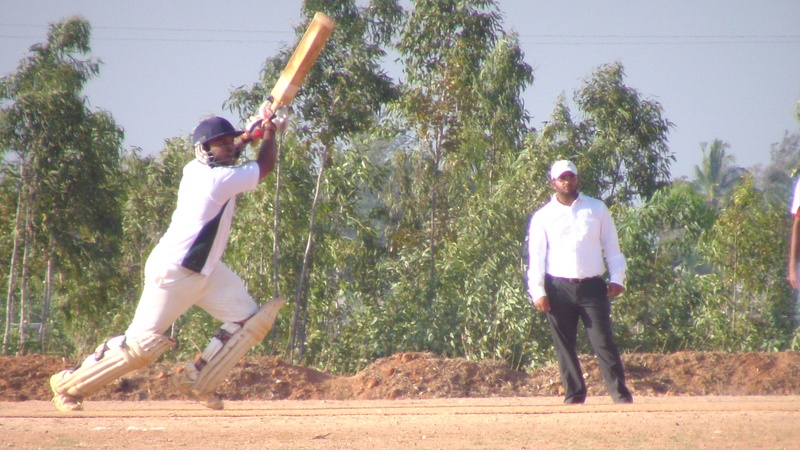 Jagmohan’s rapid 20-ball 39 gave Wipro early momentum. 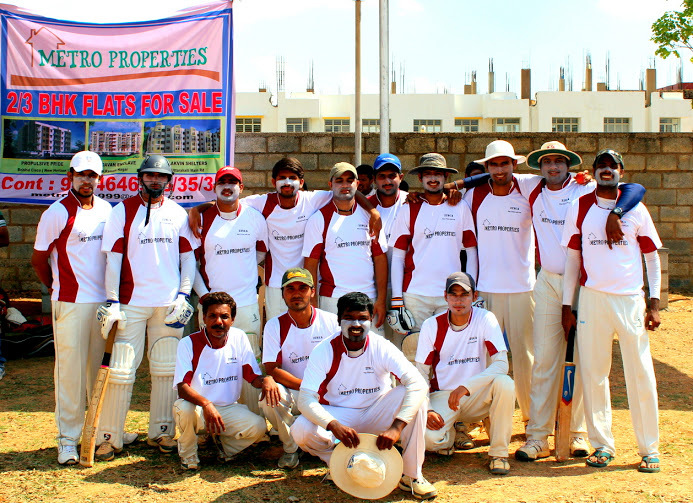 Wipro’s captain Sharath Narasimhan was ably supported by Mohit in consolidating their position with a useful 48 runs partnership for the 3rd wicket in just 6 overs. The pair relied on swift running between the wickets and put tremendous pressure on the ACT fielders and ran innumerable twos. 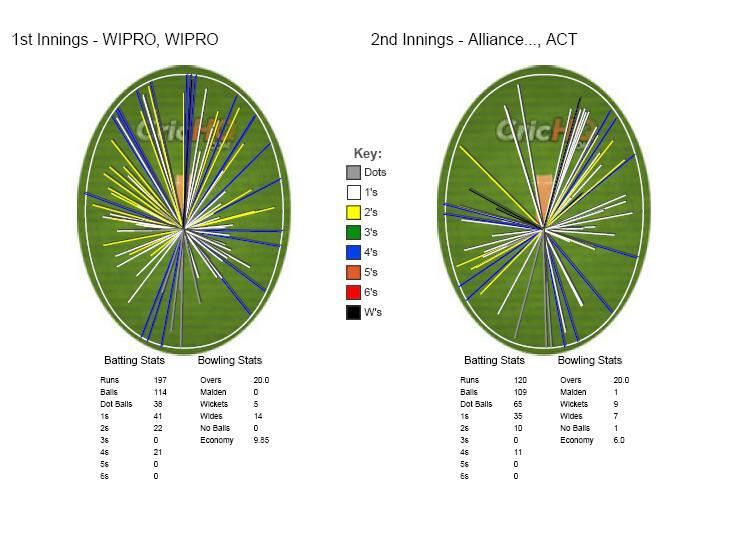 Wipro’s running between the wickets was an important feature deep into their innings as they ran 11 twos in the last 5 overs of the innings as the boundaries became harder to come by (2 boundaries in the last 5 overs). They ran a total of 22 twos in their innings (21 boundaries) and it ensured that they kept their run rate up even when the boundaries were hard to come by. Sailesh’s 30 not out in the end ensured ACT had to chase 198 for an improbable win. ACT started the chase with Vinay going after Wipro’s bowling straight away. However, 2 wickets to Sailesh in the 3rd over when he had Paddy top-edge a pull and captain Sharath trapped in front meant Wipro had pegged ACT back very early. A determined 66-run stand between Vinay and Deepak for the 4th wicket gave ACT an outside chance of overhauling Wipro’s total if at all. The pair relied on Deepak’s ability to hold fort at one end and Vinay’s ability to hit boundaries at the other to make inroads into the disciplined middle-overs bowling of Wipro. Karthik bowled his nagging fastish leg-breaks remarkably well to finish with match figures of 4-1-8-0. His leg-spinning partner Bharath reaped the benefits of Karthik’s tight bowling at the other end by picking up 3-wickets. It was Bharath who accounted for Vinay’s wicket in the 15th over. Vinay’s stroke filled 56 (43b, 8X4) was the only 50 of the game. His departure also meant the chase was derailed and ACT only managed to limp to 120 in 20 overs giving Wipro a massive win by 77 runs. “I’d say the start was important and we put up good partnerships through the innings. It is not about big runs, but a string of partnerships. That is crucial in T20 cricket,” summed up the winning captain Sharath Narasimhan at the end of the game. 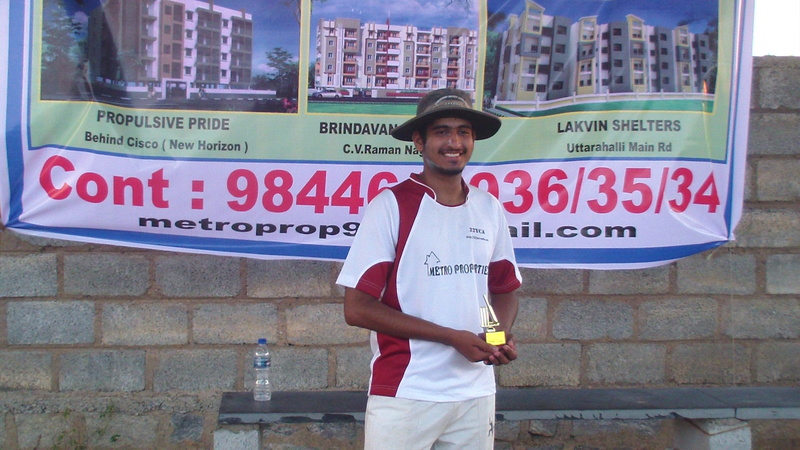 Karthik with the Performer of the Match trophy for his fine all-round contribtion.